Recyclable plastic candle holders, tossed into the trash. Hundreds of pounds of untouched food, thrown out every day. These are just a few of the wasteful practises of the hospitality industry that inspired Lucy Cullen to make big changes in her community. With over seven years of experience working in the hospitality industry, Lucy became frustrated with the amount of waste she saw each day, including a surprising absence of recycling and composting programs. It soon became Lucy’s personal mission to make the hospitality industry more sustainable. Now the co-founder of a social enterprise called terus, Lucy assists restaurants in improving their bottom line through sustainability initiatives in areas that include waste reduction, staff training and operation standards. With her first client, Lucy implemented a fruit rescue program – instead of throwing out fruit that had been zested for cocktails, the fruit was collected and juiced and put back into the restaurant for sale. This simple initiative diverted 248 pounds of edible fruit from landfill and generated over $10,000 in profit annually (that’s equal to $358,000 in sales). Lucy’s friends speak of her immense passion for bringing about environmental change and a desire to improve the quality of life of all human beings. Her enthusiasm is felt in community projects beyond the hospitality industry, including a free monthly event series called Wine for the World. These events provide a safe space to learn and engage in open conversation with neighbours and friends about the environment and sustainability. It offers the opportunity for people of different personal and professional backgrounds to mingle and connect, free of judgement or ridicule. The first Wine for the World event included a screening of the movie “Sharkwater” – a film that sparked Lucy’s interest in environmental issues at the age of 16 and inspired her to study anthropology and environmental studies at the University of Toronto. The film was such a revelation for Lucy that the name of her company, terus was inspired by a species of shark. Adam, a client of Lucy's, is inspired by her tireless efforts to make the food industry more sustainable. He always assumed that “going green” would increase costs for his business, but was astounded that Lucy’s sustainability projects have helped him reduce business expenses. Adam admires Lucy’s ingenuities for making environmentalism profitable for restaurants. Lucy inspires others to take responsibility as humans to help make the world a better place. She inspires innovation, creativity, and forward thinking. Lucy incites community engagement and encourages others to come together to learn, teach, connect, and discuss. One of Lucy’s long-term goals is to open the first true zero waste restaurant in Toronto, and set the standards of green hospitality within the GTA. 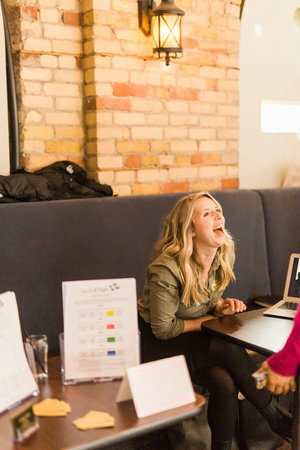 Lucy is the event manager for a Toronto based women’s environmental group called Ecobabes. During her undergraduate degree, Lucy studied environmental science in both Ecuador and Australia. Through her work with terus, Lucy showed a small business how to improve profits by over $10,000 annually. The SocialVentures Zone congratulates Lucy for her continued work to help create more sustainable food systems by encouraging restaurants to adopt environmental practices. We are proud and honoured to work with innovators and change-makers like Lucy! The School of the Environment at the University of Toronto is delighted to congratulate alumnus Lucy Cullen for being chosen as one of Canada's Top 25 Environmentalists Under 25 this year. As Co-Founder & CEO of terus, Lucy has put her passion for the environment into action. By bringing sustainability to the hospitality industry, Lucy is making a positive difference in the world. Congratulations on this well-deserved honour!